Since eDressit updated its sizes, many customers come to visit and pay attention to its products. 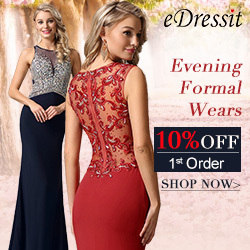 In 2018 new arrival dress collections, you are sure to find out many beautiful and fashion prom dresses, evening dresses with many styles and colors for sale. If you are there choosing a dress, you are suggested to choose the dress according to your own body size, body figure and tastes. As there are so many choices, you may not know which dress is the best one for you. Then turn to its help center. They will help you. And here, i suggest these 3 sets dresses for different occasions. If you already made your own decision, just go ahead for buying the dress. They are exquisitely tailored with slender straps under looming tulle and delicate overlace bodice that honor the waist, and cascaded with flattering floor-skimming skirt. Style it with stilettos for maximum movement. The scalloped and beaded neckline of the two dresses show the distinctive side of eDressit's feminine aesthetic. It's crafted to an asymmetric silhouette with floral lace appliques at the front, and the midi skirt is adorned with gathered ruffles. Add pin-thin heels to complete an enchanting evening look. The two off the shoulder mermaid mikado evening dresses are a sublime example of eDressit's vintage design ability. They are all shaped with a off-the-shoulder v-neck neckline and a coordinating sparkly beaded belt around the waist, and is finished with a asymmetric trumpet skirt that is bound to flutter with every step. Pin-thin heels will make the perfect evening pairing. Choose one for your coming occasions. You can also see more in our new collections or certain occasion dresses. Such as wedding guest dresses, reception dresses, bridesmaid dresses, mother of the bride dresses, etc.